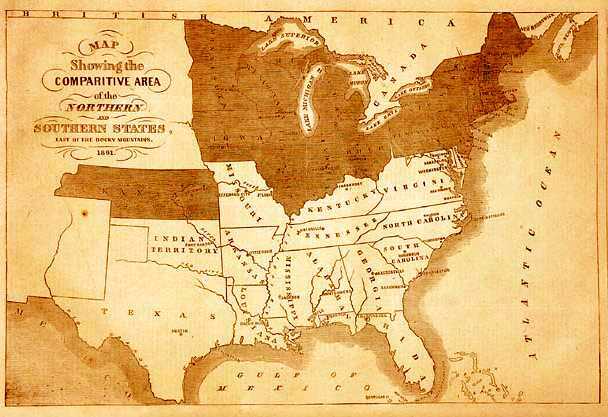 The Confederate States of America's supreme law was the Constitution of the Confederate States of America (CSA) adopted on March 11, 1861, and in effect through the conclusion of the American Civil War. The CSA, prior to the constitution's passage, operated under a Provisional Constitution from February 8, 1861 to March 11, 1861. The original Provisional Constitution is currently located at the Museum of the Confederacy in Richmond, Virginia, and differs slightly from the version later adopted. The engrossed CSA Constitution is currently located in the University of Georgia archives at Athens, Georgia. 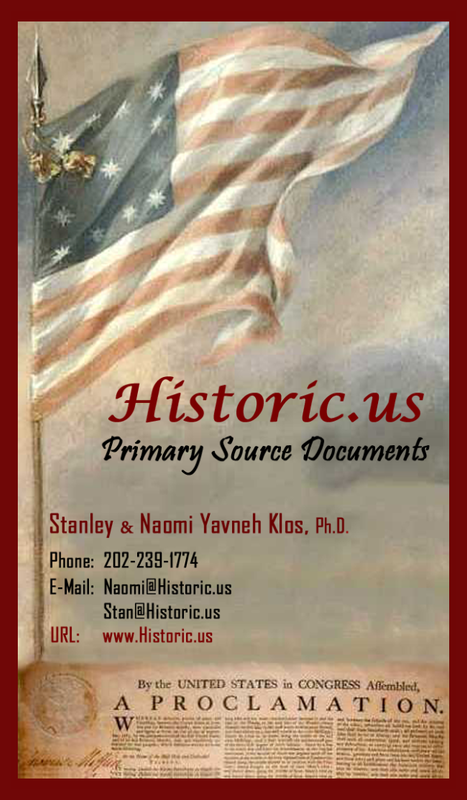 CONSTITUTION OF THE CONFEDERATE STATES OF AMERICA and the UNITED STATES OF AMERICA 21 pages printed in double columns. A rare, early, and extremely important printing of the Constitution of the Confederacy - the version that was sent out to the seceded states for ratification. 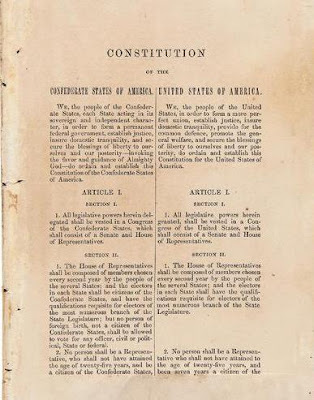 This printing was done shortly after the adoption of the constitution by the Confederate Congress on March 11, 1861, and includes the text of the Confederate Constitution and the United States Constitution in side by side columns. We, the people of the Confederate States, each State acting in its sovereign and independent character, in order to form a permanent federal government, establish justice, insure domestic tranquility and secure the blessings of liberty to ourselves and our posterity invoking the favor and guidance of Almighty God do ordain and establish this Constitution for the Confederate States of America. Section I. All legislative powers herein delegated shall be vested in a Congress of the Confederate States, which shall consist of a Senate and House of Representatives. Section 2. (I) The House of Representatives shall be composed of members chosen every second year by the people of the several States; and the electors in each State shall be citizens of the Confederate States, and have the qualifications requisite for electors of the most numerous branch of the State Legislature; but no person of foreign birth, not a citizen of the Confederate States, shall be allowed to vote for any officer, civil or political, State or Federal. Section 3. (I) The Senate of the Confederate States shall be composed of two Senators from each State, chosen for six years by the Legislature thereof, at the regular session next immediately preceding the commencement of the term of service; and each Senator shall have one vote. Section 4. (I) The times, places, and manner of holding elections for Senators and Representatives shall be prescribed in each State by the Legislature thereof, subject to the provisions of this Constitution; but the Congress may, at any time, by law, make or alter such regulations, except as to the times and places of choosing Senators. Section 5. (I) Each House shall be the judge of the elections, returns, and qualifications of its own members, and a majority of each shall constitute a quorum to do business; but a smaller number may adjourn from day to day, and may be authorized to compel the attendance of absent members, in such manner and under such penalties as each House may provide. Section 6. (I) The Senators and Representatives shall receive a compensation for their services, to be ascertained by law, and paid out of the Treasury of the Confederate States. They shall, in all cases, except treason, felony, and breach of the peace, be privileged from arrest during their attendance at the session of their respective Houses, and in going to and returning from the same; and for any speech or debate in either House, they shall not be questioned in any other place. 'o Senator or Representative shall, during the time for which he was elected, be appointed to any civil office under the authority of the Confederate States, which shall have been created, or the emoluments whereof shall have been increased during such time; and no person holding any office under the Confederate States shall be a member of either House during his continuance in office. But Congress may, by law, grant to the principal officer in each of the Executive Departments a seat upon the floor of either House, with the privilege of discussing any measures appertaining to his department. Section 7. (I) All bills for raising revenue shall originate in the House of Representatives; but the Senate may propose or concur with amendments, as on other bills. (I) To lay and collect taxes, duties, imposts, and excises for revenue, necessary to pay the debts, provide for the common defense, and carry on the Government of the Confederate States; but no bounties shall be granted from the Treasury; nor shall any duties or taxes on importations from foreign nations be laid to promote or foster any branch of industry; and all duties, imposts, and excises shall be uniform throughout the Confederate States. Section 9. (I) The importation of negroes of the African race from any foreign country other than the slaveholding States or Territories of the United States of America, is hereby forbidden; and Congress is required to pass such laws as shall effectually prevent the same. Section 10. (I) No State shall enter into any treaty, alliance, or confederation; grant letters of marque and reprisal; coin money; make anything but gold and silver coin a tender in payment of debts; pass any bill of attainder, or ex post facto law, or law impairing the obligation of contracts; or grant any title of nobility. (3) The electors shall meet in their respective States and vote by ballot for President and Vice President, one of whom, at least, shall not be an inhabitant of the same State with themselves; they shall name in their ballots the person voted for as President, and in distinct ballots the person voted for as Vice President, and they shall make distinct lists of all persons voted for as President, and of all persons voted for as Vice President, and of the number of votes for each, which lists they shall sign and certify, and transmit, sealed, to the seat of the Government of. the Confederate States, directed to the President of the Senate; the President of the Senate shall,in the presence of the Senate and House of Representatives, open all the certificates, and the votes shall then be counted; the person having the greatest number of votes for President shall be the President, if such number be a majority of the whole number of electors appointed; and if no person have such majority, then from the persons having the highest numbers, not exceeding three, on the list of those voted for as President, the House of Representatives shall choose immediately, by ballot, the President. But in choosing the President the votes shall be taken by States, the representation from each State having one vote; a quorum for this purpose shall consist of a member or members from two-thirds of the States, and a majority of all the States shall be necessary to a choice. And if the House of Representatives shall not choose a President, whenever the right of choice shall devolve upon them, before the 4th day of March next following, then the Vice President shall act as President, as in case of the death, or other constitutional disability of the President. Section 2. (I) The President shall be Commander-in-Chief of the Army and Navy of the Confederate States, and of the militia of the several States, when called into the actual service of the Confederate States; he may require the opinion, in writing, of the principal officer in each of the Executive Departments, upon any subject relating to the duties of their respective offices; and he shall have power to grant reprieves and pardons for offenses against the Confederate States, except in cases of impeachment. Section 3. (I) The President shall, from time to time, give to the Congress information of the state of the Confederacy, and recommend to their consideration such measures as he shall judge necessary and expedient; he may, on extraordinary occasions, convene both Houses, or either of them; and in case of disagreement between them, with respect to the time of adjournment, he may adjourn them to such time as he shall think proper; he shall receive ambassadors and other public ministers; he shall take care that the laws be faithfully executed, and shall commission all the officers of the Confederate States. Sec. 4. (I) The President, Vice President, and all civil officers of the Confederate States, shall be removed from office on impeachment for and conviction of treason, bribery, or other high crimes and misdemeanors. Section 1. (I) The judicial power of the Confederate States shall be vested in one Supreme Court, and in such inferior courts as the Congress may, from time to time, ordain and establish. The judges, both of the Supreme and inferior courts, shall hold their offices during good behavior, and shall, at stated times, receive for their services a compensation which shall not be diminished during their continuance in office. Section 2. (I) The judicial power shall extend to all cases arising under this Constitution, the laws of the Confederate States, and treaties made, or which shall be made, under their authority; to all cases affecting ambassadors, other public ministers and consuls; to all cases of admiralty and maritime jurisdiction; to controversies to which the Confederate States shall be a party; to controversies between two or more States; between a State and citizens of another State, where the State is plaintiff; between citizens claiming lands under grants of different States; and between a State or the citizens thereof, and foreign states, citizens, or subjects; but no State shall be sued by a citizen or subject of any foreign state. Section 3. (I) Treason against the Confederate States shall consist only in levying war against.them, or in adhering to their enemies, giving them aid and comfort. No person shall be convicted of treason unless on the testimony of two witnesses to the same overt act, or on confession in open court. Section 1. (I) Full faith and credit shall be given in each State to the public acts, records, and judicial proceedings of every other State; and the Congress may, by general laws, prescribe the manner in which such acts, records, and proceedings shall be proved, and the effect thereof. Section 2. (I) The citizens of each State shall be entitled to all the privileges and immunities of citizens in the several States; and shall have the right of transit and sojourn in any State of this Confederacy, with their slaves and other property; and the right of property in said slaves shall not be thereby impaired. Section 3. (I) Other States may be admitted into this Confederacy by a vote of two-thirds of the whole House of Representatives and two-thirds of the Senate, the Senate voting by States; but no new State shall be formed or erected within the jurisdiction of any other State, nor any State be formed by the junction of two or more States, or parts of States, without the consent of the Legislatures of the States concerned, as well as of the Congress. Section 1. (I) Upon the demand of any three States, legally assembled in their several conventions, the Congress shall summon a convention of all the States, to take into consideration such amendments to the Constitution as the said States shall concur in suggesting at the time when the said demand is made; and should any of the proposed amendments to the Constitution be agreed on by the said convention, voting by States, and the same be ratified by the Legislatures of two- thirds of the several States, or by conventions in two-thirds thereof, as the one or the other mode of ratification may be proposed by the general convention, they shall thenceforward form a part of this Constitution. But no State shall, without its consent, be deprived of its equal representation in the Senate. I. The Government established by this Constitution is the successor of the Provisional Government of the Confederate States of America, and all the laws passed by the latter shall continue in force until the same shall be repealed or modified; and all the officers appointed by the same shall remain in office until their successors are appointed and qualified, or the offices abolished. I. The ratification of the conventions of five States shall be sufficient for the establishment of this Constitution between the States so ratifying the same. South Carolina: R. Barnwell Rhett, C. G. Memminger, Wm. Porcher Miles, James Chesnut, Jr., R. W. Barnwell,William W. Boyce, Lawrence M. Keitt, T. J. Withers. Mississippi: Alex. M. Clayton, James T. Harrison, William S. Barry, W. S. Wilson, Walker Brooke, W. P. Harris,J. A. P. Campbell. Texas: John Hemphill, Thomas N. Waul, John H. Reagan, Williamson S. Oldham, Louis T. Wigfall, John Gregg,William Beck Ochiltree.